For many millennials, jumping head first into investing is not easy. Many of them have jarring memories of rough stretches in the market — most notably, the crash in 2007–2008 that led to the Great Recession. One recent survey from Legg Mason Global revealed that 82 percent of millennials say their investment decisions are influenced by that financial crisis and ensuing economic downturn. This wariness, however, could be harmful to millennials' long-term financial prospects. If they are not investing now, they may not be accumulating enough wealth for a comfortable retirement. 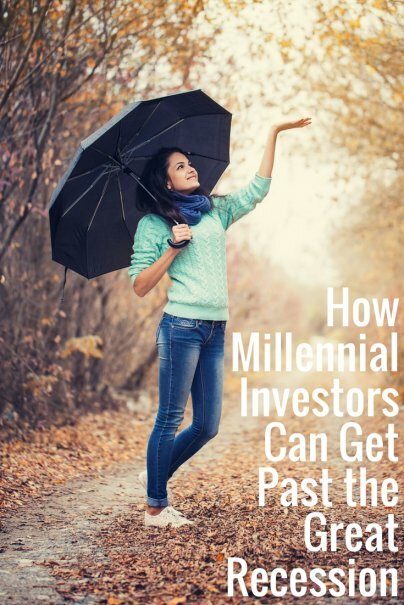 How can millennials get over their fear and begin putting their cash back into stocks and other investments? It's impossible to ignore the 35 percent plunge in stock market prices that took place in 2008. No question, a lot of people lost a lot of money that year. But do you know what happened in 2009? The market rose by more than 25 percent. And it went up the next year. And the year after that. In fact, the S&P 500 has seen positive gains every single year since the market crash, and 2017 promises to be the ninth straight year of positive returns. Moreover, the market rose for the five years before the 2008 crash. That's positive returns in 14 out of the last 15 years. With consistent returns like that, it's silly to dwell on a single rotten year, especially when you have a long way to go before retirement. You may be terrified about putting your money in stocks after enduring the Great Recession. So consider starting small, with something you're familiar with. Buy some stock in a strong company you know and like. If you eat a lot at McDonald's, buy some shares. Do you subscribe to Netflix? Buy shares of the company. Do you shop at Amazon? Go ahead, buy a few shares. This will get you started, and if you see these investments go up in value, you may overcome your fear of investing. When that happens, begin placing more of your savings into a wider array of investments and build a full portfolio. Sometimes you just need someone to talk to. Deep down, you know you should probably be investing your money and saving aggressively for retirement, but you aren't sure where to start. Perhaps you don't feel equipped with enough information to feel at ease. Most certified financial planners will be happy to sit down and have a conversation with you. They can help you get started investing in a way that will be within your risk tolerance. They'll explain how the investments work and point to the average annual returns. They can tell you about strategies that can help you grow your money while protecting it against any future market crashes. Any adviser worth their salt is not going to talk down to you; in fact, if they want your business, they will do whatever they can to make you feel comfortable before you invest a dime. The Great Recession wasn't the first time that the markets took a tumble. They fell precipitously after the tech bubble burst, and after the attacks of September 11. The markets fell more than 20 percent in a single day in October of 1987. Just about every decade has had at least one year that was bad for investors. Those who lived through those crashes, however, will tell you that things rebounded every time, and in many cases they were able to take advantage of depressed prices to realize larger gains in the end. For sure, there are people who chose to shy away from investing altogether after enduring a bad loss. But most people who lived through these downturns will offer the advice of "This too shall pass." Most millennials are still decades away from retirement, so it makes sense to invest in mostly stocks, which usually offer high returns in exchange for some risk. But if you're risk tolerance is low, it's still possible to generate solid returns with a more conservative approach. Feel free to mix in some bonds or dividend stocks that have performed well over time. Look at industry sectors like consumer goods that have shown solid growth over the years with relatively low volatility. Be aware that you will sacrifice some return for taking this lower-risk approach, but you can still build a sizable retirement fund if you give it time to grow. If you are skittish about investing, that should not be an excuse to avoid saving money at all. You may not feel comfortable putting your money in the markets, but it's imperative that you at least spend less money than you earn and avoid the crippling effects of debt. Ideally, you will want to invest a good portion of your savings, but if you can't get over your fear of the markets, make sure you're putting aside cash for emergencies and large expenses. Perhaps after building a large enough cash reserve, you'll become frustrated with the measly returns from bank interest and look to invest more aggressively. Outside of financial market strategies, there are other ways you can make yourself less vulnerable to a financial crash. You may not be able to control the economy or the performance of the stock market, but you can control how attractive you might be to employers. Your education shouldn't end when you leave college. Don't be afraid to continue learning, both in the classroom and on the job. Take on new challenges and learn new skills. This might mean learning to code or becoming an expert in Excel or web design. Or, maybe some advanced writing or graphic design skills will help you. Bolstering your resume in this way will improve your chances of landing and keeping a job, and may lead to a higher income. If there is another market crash and recession, you'll feel confident that you can weather the storm.